There are many occasions when it has taken a synthetic scholar to point out to me the overall structure of a constellation of facts which I was conscious of prior. So it is with Lieberman’s work. I had known that the eruption of the Thai peoples into Southeast Asia occurred with the last 1,000 years, before which the peninsula was divided between Tibeto-Burman populations to the west and Austro-Asiatic languages to the east (the latter divided between the Khmer and Vietnamese). Additionally, it is presumed that the Tibeto-Burman languages themselves displaced Austro-Asiatic in the western zone (as evident by the persistence of Mon in modern Burma). What was noted in volume 1 of Strange Parallels though is that the three geographical regions engaged with and assimilated the Thai invasions different. In the center the Thai succeeded in dominating the previous groups and imposing their identity upon the region. It is often asserted that modern Cambodia’s existence as an independent state is a function of the protection conferred upon it by the French from the expansive ambitions of the Empire of Siam. But in the east the Vietnamese state was barely impacted by the Thai folk wandering. As in China the Thai in Vietnam are marginalized “mountain tribes.” Finally, in the west, in the zone which became Burma, the Thai did not take over the cultural commanding heights. But neither were they absolutely marginalized as in the east. Rather, the Shan people became part of the of the Burmese landscape, integrated into the Theravada Buddhist culture, but also a significant secondary ethnos to the Burman majority (along with Karens, Mons, etc.). What does this have to do with genetics? Possibly everything and nothing, and all answers in between. The massive shift in ethno-linguistic identity in the center of mainland Southeast Asia, its lack in the east, and position at the equipoise in the west, should be excellent tests of propositions as to the nature of the spread of such ethno-linguistic identities. Is it pure construction, demographic replacement, or some quantitative combination of the two parameters? Unfortunately the BMC Genetics paper focuses only on Y chromosomes and mtDNA, the paternal and maternal lineage. These markers are informative, but I’d rather look at total genome content. The ethnic coverage in a small area of northern Thailand though is impressive. The open circles represent Mon-Khmer ethnic groups, the dark ones Thai. The Mon-Khmer are the presumed indigenes, while the Thai are intrusive. At least over the past 1,000 years. Below I’ve reedited the Y and mtDNA multidimensional scaling plots. The Y is on the left, and mtDNA on the right. The clustering pattern shows relationships across the lineages. 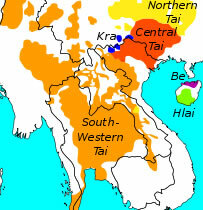 Again, the open markers represent Mon-Khmer groups, and the closed ones Thai. Since the paper is open access I invite you to read their interpretations. All I’d say is that the clustering of male Thai lineages is very interesting, and is well explained by the model of groups of related men being intrusive to a region, and taking wives from the indigenes. In contrast the Mon-Khmer Y chromosomal lineages scatter about more, and that may be due to the fact they coalesce back to common ancestors far further back in history. The intrusion of the Thai into Southeast Asia may then be demographically characterized by a migration of male warbands. In regions where these warbands managed to topple the previous order, as in central mainland Southeast Asia, they may have then monopolized access to women and entered into a period of demographic expansion. Luckily we do have some thick-marker autosomal data. To the left I’ve reedited a figure generated with the HUGO Pan-Asian data. The bar plot is at K = 14. I’ve excised many of the extraneous populations. The colors within the bar plot correspond to associations with broader language families. So red seems to be Austro-Asiatic, while blue is Thai. You can see in the figure that the Chinese Thai lack the red Mon-Khmer component. 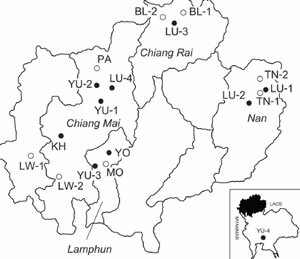 Interestingly the the Hmong of upland Southeast Asia, who are culturally marginal to the dominant Theravada Buddhist culture of the lowlands, exhibit evidence of very sharp differentiation from the Thai and the Austro-Asiatic groups. They lack the affinity with island Southeast Asians, Malays, and Taiwanese Aborigines, which seems common amongst the South Chinese more broadly. The Karen of Thailand are probably the best proxy we have for the Tibeto-Burman people of Burma, who post-date the Austro-Asiatic, and predate the Thai. Going by these data it looks as if the Karen are very hard to differentiate from the Austro-Asiatic populations, though very distinctive from the Thai. The Pan-Asian data set leaves a lot to be desired. There’s not much coverage of the east or west. I suspect that Southeast Asia is going to be somewhat complex, and extrapolating from the correlations between languages and genes in Thailand is going to get us only so far. But it’s a start. In Strange Parallels the author makes the case that mainland Southeast Asia can tell us a lot about generic Eurasian historical process. I hope, and suspect, that it can tell us something more general about the interplay between language and genes over time in other regions as well. 4 Comments to "Language, Genes, & Peoples of Southeast Asia"
The red element in the Malays and Indonesians is interesting in comparison to the lack of it in the Taiwanese and Filipino groups. Might that indicate that Austro-Asiatics were early immigrants to the archipelago, only to be culturally swamped by Austronesians moving southwest from the Philippines? It’d be interesting to see how much, if at all, that red element appears in Eastern Indonesia and Polynesia. Austro-Asiatic languages turn up in two interesting places which might illuminate this picture. Firstly, the Munda in Eastern India, and secondly the Negrito Orang Asli of central Malaysia, who are genetically distinct and are generally thought to have adopted those languages via farmers around them. So it seems like the Austro-Asiatics might have been the first rice farmers in the region, with the mastery of rice cultivation causing an explosion of their populations out of southern China, as far as India and Indonesia. Then gradually the other groups – Tibeto-Burman, Tai and Austronesian – invaded and dominated what were once Austro-Asiatic domains. i don’t know that much southeast asian history, but it does look like the model you’re positing works. it’s kind of what i had in mind without knowing as much as you about the the region. In the figure from the HUGO Pan-Asia data, the Han are consistently paraphyletic… but I’m not sure what to make of it. 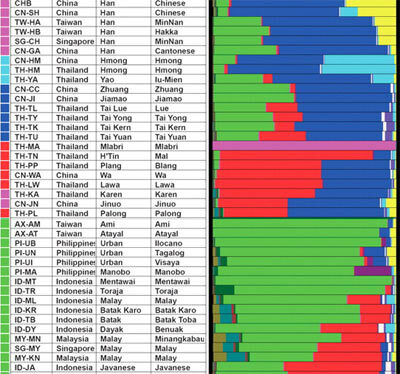 I imagine the varying levels of Austronesian admixture throw it off, but the Singapore Han and Taiwanese Han have almost identical bars but are still not put in the same clade. Other than the Han and the Thais (who are scattered all over the place), the cladogram is just about what one might had expected. but I’m not sure what to make of it. I imagine the varying levels of Austronesian admixture throw it off, but the Singapore Han and Taiwanese Han have almost identical bars but are still not put in the same clade. the taiwanese would be 90% from fujian. the singapore han would be more more like 50% from fujian i think (with cantonese, baba, hakka, and even people from north china in the mix there). the paraphyly of the han shows up in several of these sorts of analyses. depends on coverage and the reference populations.